Right in sync with warmer weather, which arrived early in much of the country, the nation’s boatbuilding industry saw its spring selling season get off to a surprisingly strong start in February. Sales in the industry’s main powerboat segments jumped 29 percent for the month, to 4,386 boats, from February 2011, and they rose 28 percent industrywide, to 6,238, according to figures compiled by Aarn Rosen, national sales manager at Statistical Surveys Inc.
“To me, it shows pent-up demand and renewed consumer optimism,” Rosen said, adding that the figures reflect the positive attitude that builders and dealers said they saw among visitors at the winter boat shows. “They’re writing more hard orders than they’ve seen in the last three years” and those orders are turning into final sales, Rosen said. For the first two months of 2012, sales are up 23.5 percent in the main powerboat segments and 21.7 percent industrywide. Solid gains were again reported in two categories of 16-foot and larger aluminum boats that have been strong performers for the last year. 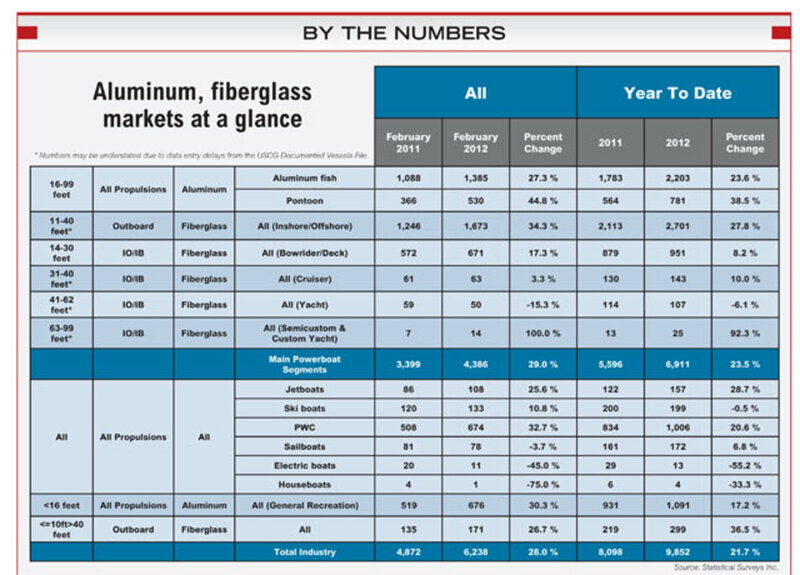 Sales of aluminum fishing boats rose 27.3 percent in February, to 1,385, and sales of aluminum pontoon boats rose even more — 44.8 percent, to 530. Sales of aluminum boats smaller than 16 feet rose 30.3 percent, to 676 boats. For January and February, sales of aluminum fishing boats are up 23.6 percent and sales of aluminum pontoon boats are up 38.5 percent. Sales of sub-16-foot aluminum boats are up 17.2 percent for the same period. Sales in the high-volume 11- to 40-foot fiberglass segment were up 34.3 percent in February, to 1,673 boats, and are 27.8 percent higher for the year. Sales in the core 14- to 30-foot fiberglass segment rose 17.3 percent, to 671 boats, and are 8.2 percent higher for the year. Sales in the 63- to 99-foot semicustom and custom yacht category doubled from a year earlier, to 14 yachts in February. Year-to-date sales have nearly doubled to 25 yachts. “You’re seeing the fiberglass segment start to show the [consumer] optimism that we’ve been seeing in the aluminum segment,” Rosen said. The sales data for February are based on information from 27 early reporting states that represent about 60 percent of the U.S. boat market. Reports of sales of documented vessels were complete only through Jan. 31 because of data entry delays at the Coast Guard, Rosen said, which means sales totals for boats 30 feet and larger are significantly understated in the data. In the main powerboat segments, fiberglass sales fell only among 41- to 62-foot yachts. Fifty boats were sold in that category in February, nine fewer than in the same month last year, a drop of 15.3 percent, although Rosen said he wouldn’t be surprised if the category eventually shows a gain once the Coast Guard’s data are more up to date. Through February, sales in that yacht category are lower by seven boats, or 6.1 percent, at 107. Sales of personal watercraft rose 32.7 percent in February, to 674 units, and are up 20.6 percent for the first two months of the year. Sales of jet boats rose 25.6 percent, to 108, and are up 28.7 percent for the year; sales of ski boats rose 10.8 percent, to 133, but are lower by one boat, or 0.5 percent, at 199 for the year. Sailboat sales fell slightly, from 81 to 78, a decline of 3.7 percent. Year-to-date sales are higher by 11 boats, or 6.8 percent, at 172.